The first few months of 2017 reading have not been as breathtaking as the comparable period in 2016. Nevertheless, the feeling of having gotten my reading mojo back persists, and this list of recent reads, a mostly-literary bunch (a lot of my recent genre reading has been for my New Scientist column, and you can find my thoughts on those books there) with a few awards contenders and interesting also-rans thrown in, represents a strong first half of the year. At least one of these books, I think, will end up on my year's favorite list, and almost all of the others are books I'm glad I took the time to read. Too Like the Lightning by Ada Palmer - It's interesting that in the space of a single year, Tor published two debut novels about non-dystopian, non-corporatist future societies in which the boundaries of national and ethnic identity have been replaced by global affinity groups, to which people assign themselves according to their interests and philosophy. For all my reservations about its technothriller plot, I have to say that I prefer Malka Older's Infomocracy to Palmer's Too Like the Lightning, largely because I find the world in that book more interesting, and more believable as a place where people like me might possibly live. There's no denying that Palmer's project is more ambitious than Older's. She plays more elaborate games with narrative voice, telling the story through the eyes of Mycroft Canner, a criminal sentenced to a lifetime of community service for a crime whose details we don't learn until fairly late in the novel, but whose skills as an analyst have put him in the path of the great and good of the society of the 25th century. Obsessed with the philosophers of the Enlightenment, and convinced that he is writing for the edification of some far-future civilization even more advanced than his own, Mycroft is a vain fame-hound, who seeks constantly to impress us with the quality and power of the people he rubs shoulders with. More crucially, he is convinced by the Great Man theory of history, and the portrait he paints of his society is driven by emperors, CEOs, and grey eminences that, to his way of thinking, have shaped civilization through the sheer power of their greatness. Reading Too Like the Lightning is thus an exercise in trying to see past Mycroft's point of view, and determine how much of what he tells us of his world is accurate, and how much his own fabrication. It's an interesting exercise, and Palmer's skill at creating such an unpleasant, fawning creature as Mycroft (who is nevertheless smart and capable), is to be lauded. But none of this gets past my core problem with the book--that I did not for a minute believe in the society Palmer created in it. Palmer's world is supposedly divided into several massive "hives", whose members are dedicated to certain principles or projects--the Humanists seeks to perfect themselves, excelling in sports or martial arts; the Utopians seek constant scientific progress and are the only group still interested in space exploration; while the pan-Asian Mitsubishi clan believes that excellence can be achieved by amassing land. But these all feel like concepts, not real societies, an impression that is not helped by Mycroft's myopic focus on the most powerful and influential members of each group. Despite claiming to be a society of billions, the world of Too Like the Lightning never feels as if there are more than a few hundred people living in it. Its systems feel more like a thought experiment than something that might be able to run the lives of huge numbers of people, and its institutions appear to be driven by a few remarkable individuals, not the thousands of busy public servants that run Infomocracy's various government bodies, where even the most powerful and influential officers are merely cogs in the machine. It's possible that Palmer isn't reaching for realism in the same way that Older was, and that the thought experiment nature of her novel is deliberate. But if so, I find it hard to understand to what end, and what the experiment is meant to prove or demonstrate. There are some interesting ideas here and there--the profound hostility that this society feels towards organized religion, to the extent that theological discussion involving more than three people are prohibited, lest they devolve into a church; or the "nurturist" faction, formed in opposition to the practice of raising children to function as, essentially, living computers, but whose philosophy could just as easily be extended to argue that it is child abuse to assign a baby a gender, a religion, or a nationality. But none of these are sufficiently developed, and more importantly, there's never a sense that they are topics of public debate, so much as philosophical disagreements that the Great People we meet through Mycroft ponder in their salons. Too Like the Lightning is the first in a quartet, and the book itself is only half a story, which makes it even more difficult to gain a sense of what Palmer's project is. Conversely, it makes it a lot easier to be annoyed by certain aspects of the book and its narrator, such as Mycroft's obsession with race and gender. His descriptions of characters almost never fail to include fetishizing details of their racial heritage that seem almost to treat them like thoroughbred horses, remarking on this person's distinctive Indian hair or that person's dominant Asian facial features. As for gender, the book's society seems mostly embarrassed by the topic; the dominant pronoun is "they" and it's considered impolite to gender a person except in intimate situations. Mycroft, however, genders people constantly, according to his own system. He seems to expect us to be shocked by the fairly common-sense notion that a person's gender identity and expression don't have to be related to what's in their pants (the contents of which utterly consumes him), but in so doing he regresses to the most clichéd and essentialist definitions of gendered behavior--a man whose default mode is borderline sexual assault, a woman who simpers and bats her eyes to get what she wants. Like so much about Mycroft, the discomfort that this arouses is clearly deliberate, but the larger system of the world seems to affirm Mycroft's assumptions, as when we discover that a gendered "underground" exists in reaction to the world's rejection of gender, headquartered in a brothel where women are taught to seduce powerful men as the only means of attaining power themselves. Even the book's ending, which sets up a sort of "The Ones Who Walk Away from Omelas" dilemma that has surely been chewed to death many times already, feels juvenile, calculated to shock rather than provoke real thought. There's no question that Palmer has an ambitious, unique project planned with this series, but based on the first installment, I'm struggling to come up with a reason to keep going with it. 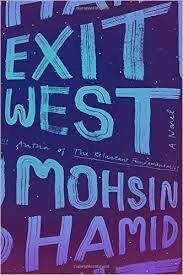 Exit West by Mohsin Hamid - Hamid's fable about immigration and refugees has a premise that puts one in mind of Colson Whitehead's The Underground Railroad--at the same time that war, economic collapse, and climate change are making refugees of more and more people, doors start appearing in disadvantaged parts of the world, transporting the people who pass through them to safer, richer countries, where their appearance is treated almost like a natural disaster. But--leaving aside that a comparison to Whitehead's magnificent novel would be unkind to almost anyone, even a writer as assured as Hamid--this fantastical device turns out to be less central to Exit West than I had expected. Far more important to the book's effect is the way that Hamid works to anonymize and universalize the phenomenon of refugeeism, and the experience of being torn from your home. While the book repeatedly stresses that its heroes, young couple Saeed and Nadia, are Muslims from a Muslim country, it also works hard to remind us that very little of what they experience is different or new. The book's opening chapters, in which Nadia and Saeed meet and fall in love against the backdrop of their city teetering on the cusp of all-out war, are affecting precisely because the life they describe is so familiar. In one chapter, our heroes are living a perfectly normal, modern life, the war in their country a constant background hum that has not yet touched their lives. A few chapters later, they are stockpiling food from rapidly-emptying supermarkets, barricading windows to protect from stray bullets, and frantically trying to get out. After Nadia and Saeed leave through the doors and arrive in Europe, Exit West becomes a narrative of the toll that leaving your home in such an abrupt, total way can have on a person and a relationship. Nadia flourishes under the challenges of her new life, relishing the opportunity to live more freely than she could have in her home. Saeed, on the other hand, turns inwards, the loss of his home and way of life turning him prematurely old, and nearly curdling him with nostalgia. Exit West is as much a love story as it is a political one, but it's a love story about how love is often situational. The challenges that Saeed and Nadia face as refugees are not the challenges they would have faced as a couple in their own country, and their relationship grows, changes, and ultimately fails in response to those challenges. Despite the sad end of its romance, Exit West is a deeply kind, hopeful novel, veering towards outright science fiction in its final chapters, when it imagines a new order to a world in which the doors exist, and in which it is easy for people to change their location and situation. It holds out hope that we will be able to see each other as people, not nationalities, and that those who are forced to leave their homes will be able to build new ones elsewhere. What is Not Yours is Not Yours by Helen Oyeyemi - Oyeyemi's first short story collection (or second if you count the linked story cycle Mr. Fox, though that volume feels much more coherent and of a single piece to me) feels a little like an opportunity for this brilliant author to try on different hats. The evocation of dark, nested fairy tales feels like Oyeyemi channeling Angela Carter. The wry surrealism, inflected by pop culture references, feels inspired by Kelly Link. And the stories that focus on Cambridge students, usually immigrants or the children of, reminded me a great deal of Zen Cho. All of which is to say that Oyeyemi's voice isn't as distinctive here as it was in Mr. Fox or White is For Witching, but nevertheless she makes the stories in What is Not Yours is Not Yours her own. Some stories here are more self-contained than others, and feel like complete statements in their own right. "'Sorry' Doesn't Sweeten Her Tea" describes a young father's bewildered helplessness as his teenage daughters observe the parade of public hand-wringing, victim-blaming, and excuse-making after an idol of theirs is accused of domestic abuse; "Presence" is about a couple, both on their nth marriage and struggling with the impulse to run for the door at the first sign of trouble, who test a new technology meant to alleviate the pain of the bereaved; "A Brief History of the Homely Wench Society" is about a long-term campus war between a men's-only social club and the women who refuse to be invited to it. Other pieces are discursive, to a point that feels almost in-jokey. "Books and Roses" is a set of nested stories in which one can feel oneself being dragged further down and down with no real hope of coming up for air. "Is Your Blood as Red as This? ", about a group of students at a prestigious puppetry academy, switches points of view and focus several times without really converging on a point. The result feels a little bit as if Oyeyemi is tooling around--which, to be clear, is by no means a reason not to read the collection, since she's a wonderful, insightful, and often quite funny writer. 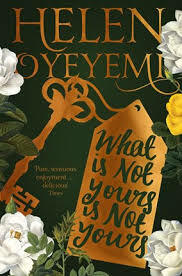 But it means that What is Not Yours is Not Yours feels a lot less focused and purposeful than Oyeyemi's novels, more like a series of experiments than the more polished work I'm used to seeing from her. Azanian Bridges by Nick Wood - Set in an alternate South Africa in which apartheid never ended, Wood's novel switches between the points of view of a psychologist and his patient. Martin has invented an "Empathy Engine", a machine designed to allow users to experience the lives of others as their own, or project their own experiences. As his first test subject, he chooses Sibusiso, a young man who sank into depression and PTSD after witnessing the death of a friend at an anti-apartheid demonstration. Soon, political forces learn about the device and try to co-opt it--the government's Special Branch want Martin to give it to them to use it as an interrogation tool, and Sibusiso's friends at the ANC try to convince him that its effects can finally topple the repressive, racist regime they've been struggling under. Both men end up on the run, and Martin in particular is forced to acknowledge how insufficient his thoughtless, ineffectual liberalism has been in a country in which doing nothing means participating in a gross injustice. Though it's great to see more (English-language) science fiction novels set in Africa and dealing with issues specific to that continent, Azanian Bridges is weakest where it deals with SFnal topics. The alternate reality in which apartheid persists into the 21st century feels tissue-thin, not really bothering to imagine, except in the most general terms, how either the country or the world would have to look for that to be the case. Perhaps Wood felt that he needed to set the novel in the present, rather than the 70s or 80s, in order to justify the technology that drives its plot, but the result feels neither here nor there. The role that 21st century technologies like the internet, cell phones, and social media play in political conflict is downplayed, and the terms in which apartheid is expressed feel similar to the ones you'd find in a contemporary narrative (though, to be fair, my knowledge about this period is extremely limited, so there may very well be nuances to Wood's updating that I'm missing). The book is much stronger in its depiction of the mundane, chiefly Sibusiso's mental health crisis, and Martin's difficulty in treating it (perhaps unsurprising, since Wood is a therapist himself). Sibusiso's illnesses are real and require treatment, but they also emerge from a political reality, and Martin's refusal to acknowledge that--to see his patient's problems as anything beyond purely personal, even dismissing Sibusiso's expressions of distrust as "identity politics"--makes it impossible to effectively treat him. The novel also raises the question of what it even means for Sibusiso to submit to treatment in a white-dominated system, one where he has every expectation of being spied upon by the people charged with his care, whose definition of good mental health inevitably includes discouraging him from future political activity, and which ultimately cares so little about him that Martin is able to skirt ethics regulations in testing the Empathy Engine on him, because there are fewer protections around a black patient. Towards its end, Azanian Bridges begins to weave together the realistic and SFnal parts its story, even if it never manages do so completely. The book doesn't give quite enough time to the assertion made by Martin and the ANC, that technologically-induced empathy can arouse the real thing (in fact, considering that Martin's story requires him to go out of his comfort zone, interacting with black South Africans and ANC operatives, one could very easily take Azanian Bridges as an argument for the old-fashioned kind of empathy-building exercises). In its final chapters, it raises the genuinely intriguing notion of distributing the Empathy Engine as a video game, where users get points for being able to empathize with others, and especially those who are demographically different from them. But this feels like an aside to the more personal, mundane story of Martin and Sibusiso's attempts to escape government attention. 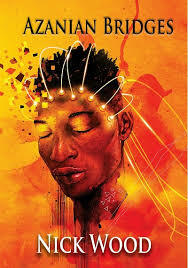 Azanian Bridges feels more like a political novel with science fiction touches than a science fiction novel, but the former--and particularly its emphasis on the issues of mental health under repressive regimes--is still worth the price of admission. 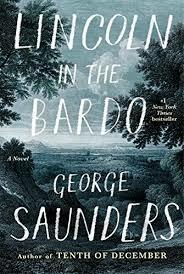 Lincoln in the Bardo by George Saunders - It was surprising to learn that Saunders, after decades as a highly-lauded short-story writer, was going to try his hand at a novel. And therefore it's perhaps not surprising to crack open Lincoln in the Bardo and learn that it stretches the definition of "novel" almost to its breaking point. Some chapters in this book are less fiction than collage, with Saunders copying a sentence here, two sentences there from biographies, letters, and historical works (some real and some invented) about Civil War-era DC and the Lincoln white house. Some of these fragments work together to create a complete picture, though sometimes they sit side-by-side, completely contradicting one another. Even in the completely fictionalized chapters, Saunders switches almost frantically, every paragraph or handful of sentences, from one point of view to another, so that the book feels almost like a screenplay: all narrative, no description. I found myself wondering, in fact, whether Lincoln in the Bardo wouldn't work better as a play or a radio drama (and indeed, the audiobook version appears to have been a major production, with different actors voicing each character, including such names as Nick Offerman, Megan Mullaly, and Keegan-Michael Key). Either way, it's a style that can take a little while to get used to, but once you do, achieves the otherworldly, cacophonous effect the novel is aiming at perfectly. The action of the book takes place over a single night in 1862, in a Georgetown cemetery where, earlier that day, Willie Lincoln, the president's third son, was laid to rest after succumbing to typhoid fever. Grief-stricken, the president returns to the cemetery to commune with his son's body, unaware that all around him, the spirits of the dead, including Willie, are in disarray. The spirits who still linger in the cemetery are the ones who have refused to move on, unwilling to admit that they are dead, hung up on mortal regrets, or simply terrified of what awaits them if they submit to a final judgment (despite the "bardo" in the title, the cosmology of this book's afterlife is largely Christian in nature, with eternal reward or punishment awaiting the dead, rather than reincarnation). The novel thus switches between the narratives of different ghosts, telling us their stories and reasons for staying behind (in that sense, it reminded me a little of Edgar Lee Masters's Spoon River Anthology, which also brings up Lincoln in connection to one of its dead narrators). But it also develops a narrative, with three of the ghosts--a middle-aged printer longing for the young wife with whom he had just started to fall in love after years of marriage; a gay student who committed suicide after romantic rejection, only to realize too late the beauty of the world he was giving up; and a priest who knows that hellfire awaits him but has no idea why--trying to convince Willie to move on, because children who linger in the bardo are quickly driven insane, while Willie insists that his father will come back for him, and that he must therefore wait. Lincoln in the Bardo is thus a tale of enlightenment--of Willie, who must grow up quickly and make his own decisions; of the ghosts who have become consumed by regret, and must remember how to live in the present if they are to still do some good in the world; and of Lincoln himself, who struggles with his personal grief and the knowledge that the nation needs him to overcome it and lead. On that last count, the novel is a little wobbly, as Saunders himself must eventually acknowledge. He has Lincoln, on the one hand, learn to cope with his grief by realizing that everyone is suffering, and that the correct response to this is not to elevate one's own grief above others' but to treat everyone with kindness. But on the other hand, Lincoln finding his way out of crippling grief also means that he is free to continue waging a brutal war that, however just, has already cost thousands of lives and will go on to cost hundreds of thousands more. If Saunders can't exactly be blamed for not finding a way out of a philosophical conundrum that has flummoxed thinkers for millennia, he also undermines his attempts to square that circle by not giving nearly as much space to the voices of black people and slaves as he does to white characters. Though the cemetery abuts a potter's field where black people were buried (and where the unquiet dead of that community still linger), these characters, and their narratives of suffering in life and being discarded in death, are secondary to the book's plot, a side-dish rather than the main meal. Especially right now, telling a story about Lincoln and the Civil War has a political significance that Saunders doesn't entirely own up to, instead focusing on Lincoln the man and the symbol. It's a choice that can end up making Lincoln in the Bardo feel a little lightweight, even as it fully accomplishes what it set out to do. As a work in its own right, however, it is, like most of the Saunders stories I've read, beautifully written, clever, surreal, and quite funny. 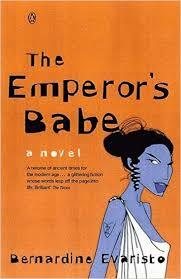 The Emperor's Babe and Blonde Roots by Bernadine Evaristo - Evaristo, and these two novels in particular, have been on my radar (and in my TBR stack) for a long time. That's it taken me so long to get to them is at least in part down to both books' outlandish, perhaps even gimmicky premises. In both cases, this is the sort of thing that either really works, or really doesn't. The Emperor's Babe, for example, tells the story of Zuleika, the daughter of Sudanese immigrants in third century London (or rather, Londinium), who marries upwards when she catches the eye of a Roman official. When he leaves for the heart of the empire for months on end, she finds herself living in bored luxury, until she catches the eye of the visiting emperor Septimius Severus. Oh, and it's also a novel in verse, whose rhymes shift effortlessly between Latin, Cockney rhyming slang, and AAVE. The audacity of the exercise--and Evaristo's skill at carrying it off--would be more than enough in their own right, but The Emperor's Babe is delightful for the deliberately wrongfooting portrait it paints of Roman-era London, as a place that is both familiar--a city of immigrants, a melting pot of cultures, a place where young people can break away from tradition and discover new ways of being--and completely foreign. The moments where Zuleika's voice seems to slide across the centuries, making references to modern technology or celebrity culture, are a deliberate rebuke to our perception of the past as stately and dignified. But so are the moments when her concerns turn out to be universal: her boredom, the trauma she carries from having been married off (and raped) at a very young age, her desire for something, either love or artistic achievement, to call her own. It's almost enough to distract from the fact that the affair itself, and Severus as a character, are rather thinly sketched. Partly this is the point--Zuleika loves the idea of being in love more than she loves her lover--but Evaristo also rushes through the affair and its aftermath in a way that she doesn't when simply allowing her heroine and setting to exist. The novel's heart is clearly in the idea of third century London as a city much like the one we know, and The Emperor's Babe is at its best when it focuses on that. Blonde Roots has a similarly eyebrow-raising premise, but this one worked less well for me. In the novel's world, the arrow of slavery pointed in the opposite direction, with African traders buying European prisoners to be sold as servants and field workers in Africa and its American colonies (here called West Japan). Our narrator is Doris (renamed Omorenomwara by her captors), who after decades of enslavement in the home of a slave ship captain and plantation owner, takes a chance to escape. In parallel storylines, we follow her escape attempt and what comes after, and the story of how she was captured and what her life as a slave was like. As in The Emperor's Babe, one has to applaud Evaristo's audacity, as well as the skill with which she constructs her world. But Blonde Roots's hold on its tone is a great deal more tenuous than in the earlier novel. At points, it is clearly a satire--something that is obvious already in the novel's punning title, but which is reinforced through the interjection of modern slang, or even invented colloquialisms such as "house wigger". In other segments, one can see Evaristo working hard to chisel at audience's (most obviously white audiences) reflexive acceptance of slavery as "just the way things were" by pointing out how absurd and clearly wrong it seems when we apply it to white Europeans--the idea, for example, that the English baronet on whose land Doris's family lived could be sold along with his tenants is wrongfooting, but it's no stranger than the idea of being sold alongside their princes and chieftains would have seemed to Africans. 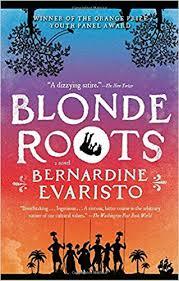 And in its final third, in which Doris leaves her relatively comfortable life as an indoors servant for back-breaking labor on a sugarcane farm, Blonde Roots seems to be telling its story completely straight, as a narrative of the horrors and abuses of slavery. It's hard to reconcile these three approaches, and the last one in particular feels undermined by the choice to make the novel's story about white people who are victimized by black people. Perhaps a big part of my problem with Blonde Roots has to do with when I read it. It's easy to forget this, but it's only in the last few years that we've started seeing works about slavery enjoying major mainstream success. In 2009, when Blonde Roots was published, it's very possible that in order to sell a work on this subject, and get past the kneejerk reaction of "but some slaves were well-treated!" or "it wasn't that bad! ", you needed a hook such as the one Evaristo employs. I suspect that if I'd read the novel closer to its publication date, I would have found it eye-opening. In 2017, however, much of what makes it powerful has been superseded by works that look slavery more squarely in the eye. Evaristo's description of Doris's journey across the Atlantic, under conditions that seem impossible for anyone to survive, is harrowing. But it's overshadowed by a similar chapter in Yaa Gyasi's recent Homegoing, whose protagonists are Africans. The tongue-in-cheek revelation that the Underground Railroad Doris escapes on is using the infrastructure of an abandoned African tube network would probably work a lot better for someone who hadn't just recently read Colson Whitehead's more expansive and affecting use of the same device. It feels, in short, as if Evaristo thought that she needed to present slavery with a protective coating of satire and ironic distance (which, again, may very well have been true at the time the novel was written) only for other authors to experience greater success by serving it straight up, in all its horror. That's not to say that there is no horror in Blonde Roots, or that the novel isn't trying to say something serious and important--its final chapters, in particular, are dripping with rage at the narrowness of its characters' horizons, the strict limitations of their hopes, even when they manage to break free; and its final argument, about the way that the legacy of slavery continues to affect our lives today, is clearly essential. But its central device ends up working against it more than it probably would have when it was published. Golden Hill by Francis Spufford - Not unlike George Saunders, it's a little surprising to see Spufford, whose career has straddled the divide between fiction and non-fiction (particularly with the undefinable but essential Red Plenty) come out with a proper novel. And, again like Saunders, Spufford's choices of format and genre are idiosyncratic. Golden Hill is a pastiche (pitch-perfect, as near as I can tell, though I admit that this is not an area in which I'm very well-read) of 18th century picaresques such as Tom Jones, in which an ambitious, good-hearted but self-absorbed young man sets out to make his fortune and ends up, through a combination of bad luck and his own fecklessness, falling flat on his face, before washing up on the shores of wisdom, temperance, and (of course) a good marriage. What sets Spufford's version apart is first its setting, the fledgling economic powerhouse of New York City in 1746. When mysterious stranger Richard Smith presents himself at one of the counting houses that litter the insular colony--then numbering only 7000 inhabitants, though representing a financial force far out of proportion to its population because of its role in clearing the money from the slave trade and the commodities produced through slave labor--with a banker's draft for more than a thousand pounds, he sets the entire town abuzz. Is he a charlatan? A spy? A political activist intended to prop up one of the sides in the colony's simmering dispute, between the royally-appointed governor, and the local representatives who want more say in the running of their government? Richard's refusal to satisfy anyone's curiosity only fans the flames, and for the sixty days he is obliged to wait before his draft can be honored, he is constantly observed and commented-upon, even as he works to insinuate himself into the community. There's another twist that Spufford performs on the familiar 18th century template, but to discuss it is more complicated, because it would involve revealing the novel's big secret. And yet the entire point of this revelation is how mundane it turns out to be. Golden Hill is structured like a heist story, with Richard's narrative deliberately obscuring from us some of the most important details of his identity (and, of course, his goal in coming to New York), and creating the impression that he is about to pull off an audacious con. This turns out to be both true and not true. What Richard is doing is fiendishly difficult and extremely dangerous to him. It is also--and to modern readers in particular--something of a letdown, the thoroughly legal use of the tools of commerce and trade to make a tiny, ultimately self-defeating dent in the system of slavery and oppression on which New York's economy runs. The genius of Golden Hill is in depicting that system, as an interlocking set of legal, economic, social, and extra-legal conventions that is so impervious to harm, so clearly constructed to prevent and crush any challenge to it, that even the small wobble Richard manages to introduce into it is a major achievement. Running through the novel is Richard's awareness of the unacknowledged community of New York, the slaves who sit in the background of every scene, and the larger numbers of them who are being transported every day to the plantations in the south and the Caribbean. It would be giving Golden Hill a little too much credit to say that it ends up being the story of these people, but its ending prioritizes their fates over those of the characters whom we've spent the story meeting in drawing rooms and banquet halls. It's a final twist on the kind of novel Spufford is imitating, one that perhaps makes Golden Hill into something entirely its own. Re: TLTL: Intriguing. I enjoyed this a great deal more than you did. Possibly I'm giving Palmer more credit and trust than you, but I didn't have the issues you did. (a) I think Palmer amply demonstrated ample variety within the Hives (and additional options outside them, that seem precisely set up as "--and if those didn't work for you" choices). We see Mitsubishi journalists and Blacklaw cooks. We glimpse European patriots and people who wear their mystery-reading on their sleeve. The story isn't about normal citizenry, but it's pretty clear to me how normal citizens live their lives. (b) I feel like the story is, in many different ways, about seemingly limitless freedom, consolidating into a few arbitrary choices. The huge variety turns out to be founded on absolute merging and cooperation. The pressures on the various Hives are pressing them to consolidate, grow one at the expense of the other, which only makes them bigger threats and forcing more extreme reactions. Right in the big infodump chapter, Mycroft goes, "Oh, yes, the Olympians used to be a big thing, but then they just got absorbed into the Humanists." So, I don't think Palmer's saying "Oh yes, if humans got absolute freedom, they'd sort themselves out into mad psychiatrists, Latin wannabes, and Asian people." I think she's pointing out that absolute freedom really hard to maintain over time, and that's one of the things I enjoyed most about the book. Well, that's probably more than enough for now :P I'm sorry TLTL didn't work for you -- I found it to be wonderfully conversation-provoking, but it looks like you didn't even find it coherent enough for that. It definitely seems to be a book that soars for some and sinks for others. As I wrote, one of the reasons I found the world of TLTL so unconvincing was that I was comparing it to a similar gloss on the same premise in Infomocracy. There's no question that TLTL is the more adventurous novel, but when I compare the airlessness of its world to the vibrancy of the one in Infomocracy, there was no doubt which one I could imagine myself living in. Speaking particularly about the Hives, Older does a much better job, to my mind, of imagining how different people might be drawn to different traits in their affinity groups, and how those groups might splinter and change. In particular, the world of her book felt like one where people of different classes, social backgrounds, and ethnic affiliations might live, whereas Palmer's world seemed afflicted by a stultifying uniformity, contributing to my sense that this was little more than a thought experiment. What all this brings me back to is the fact that I can't work out what the point of the exercise with TLTL even was. I can see what Older was trying to accomplish with Infomocracy: to examine things like the challenges of maintaining democracy in a global society, the role that the internet plays in both amplifying and endangering democratic institutions, the competing forces of ethnic, corporate, and ideological affinity in shaping the kind of society we want to live in. I have no similar idea what Palmer is trying to say with her book. Some people have suggested that it's an attempt to refute the Great Man theory of history by using Mycroft's perspective to dismantle it (I honestly can't see how you can say that Mycroft isn't in awe of Great Men, since they're literally all he talks about). But that strikes me as a bizarrely retrograde project in 2016, and I can't see what else Palmer is trying to do. I suspect that age and nationality might account for part of it, but I winced hard when reading your comment that only recently have books about slavery encountered major mainstream success. Roots came out in 1976, and Beloved in 1987. More recently, Edward P. Jones' The Known World, Toni Morrison's A Mercy, and Marlon James' Book of Night Women were all major bestsellers in (respectively) 2003, 2008, and 2009. Your point that Evaristo used sf cliche of reverse oppression as a way to bring white readers into the book may well still hold, but I remember being part of discussions about the retrograde nature of that tactic well before 2009. (And it does make me think about Steven Barnes' Lion's Blood (2002) and its sequel, which uses the same trope of black masters and white slaves to explore what blackness might be without the historical burden of slavery and with the assumption of its centrality to every narrative.) I wonder if her choice was rooted more in the realities of a British readership than in time. Certainly in the US the complaint about the difficulty of finding African-American stories that don't focus on slavery far precedes 2009, and draws on many more examples than I have here. I understand that we all have a tendency to equate our own personal knowledge base with the wider world, and I don't mean to be pedantic--but I do feel an odd type of amnesia, which erases how much work has been done on race and slavery before the so-called "age of Obama" is deeply perilous at the current global political moment. I wouldn't want to imply that there have never been books about slavery that enjoyed mainstream success before the last few years, but I think it's telling that the five works you list span a period of forty years. Meanwhile, the two books I compared Blonde Roots to - both bestsellers and award winners - were published within months of each other. Add Paul Beatty's The Sellout and Ben Winters's Underground Airlines, and that's four major works on the subject of slavery published over little more than a year. And if you include film and TV, I really don't think there's any question that there's a much wider acceptance, and appetite for, fictional depictions of slavery than just a few years ago. What's more, I think it's growing increasingly unacceptable for historical work that isn't explicitly about slavery to ignore or whitewash that element. See, within this same post, Golden Hill, which is blatantly about reexamining the kind of 18th century novel that refuses to admit what the fortunes its characters amass are founded on, and ultimately prioritizes the well-being of slaves over a romance between the hero and his love interest. My best sum-up of TLTL is also Palmer's: It's about the hope of a better future, but also accepting that it will be a long, hard and complex path. The way it does that is by talking about utopianism. Not by portraying an intended utopia, or an intended dystopia, but by portraying a society whose members feel themselves in a utopia -- and examining both its precariousness and its achievements; the good and the bad. When we're feeling the lack of Optimistic SF, TLTL is... not that, but something more nuanced, speaking of ups and downs and an optimistic trend that will also be very different than "everything actually being good." All that being said: TLTL definitely focuses on "movers and shakers," characters with immense influence and prestige. I think that ties into its strong focus on social structure and pressures -- which seem much easier to portray and to understand from a bird's-eye view than from somebody trapped within its cogs -- but I certainly see how that could be distancing. Perhaps great men, rather than Great Men -- I feel like all the Hive Leaders are simply figures which the social structure would naturally push to the top, not the Great Men who wrap the world around them, but precisely the type of people you'd predict would rise to the heights of power. They each have their distinguishing characteristics, but they're also all a blur, serving similar functions in similar ways, and eventually being revealed to all be chips off the very same block. It's Bridger and J.E.D.D. Mason that Mycroft's got his hopes pinned on. 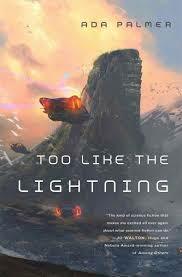 Thank you for this review of Too Like the Lightning! I actually think I enjoyed the narrative tricks a little more than you did (much as I reviled the narrator and his racialising / gendering fetishes) but I agree so much with everything you wrote. The race. The awful gendering. The retrogressiveness. It felt like the alleged billions of people that live there didn't really exist, and at the same time, the focus on "Great Men" was shallow and fawning. I'd add one more thing that to me is perhaps even more damning in a way - we can assume that all the racism, sexism and juvenile titillation by perversion and macabre murder are intentional ways of referencing 18th century literature, and intended to be deconstructed *at a future point* or at least serve some purpose. However, the novel, as author states, is supposed to enter into a "Conversation" with the philosophers of the Enlightenment (a very selectively chosen group thereof, and not one I'd have chosen), and for me it fails to say anything much of value or to even make me remotely interested in the philosophy/philosophers it lionises.